My Chihuahua Kilo still sees just fine but several years ago, I noticed my aging terri-poo Joey was having problems seeing things. The Vet said he had Glaucoma and nothing could really be done for it. So we adjusted. And Joey did adjust quite well. It turns out, vision is not a dog’s dominant sense like it is for humans. Vision loss or blindness in dogs can be a congenital condition or it can develop during your pet’s life. Trauma or infections can be the cause of acute vision loss; on the other hand, progressive diseases such as cataracts, retinal degeneration and glaucoma may cause chronic vision loss. Chronic vision loss is common in old dogs, however, in some cases it is not detected because pet parents attribute their clumsiness and disorientation to age and not to failing eyesight. Vision loss can potentially occur in any canine, regardless of breed. However, many cases of blindness are thought to be genetic and breed or age-specific, for example, white dogs, such as white Boxers and Great Danes have a greater prevalence of blindness. 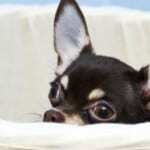 Chihuahua dogs are susceptible to blindness due to progressive retinal atrophy. 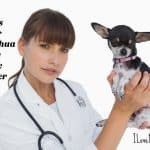 Progressive retinal atrophy is a group of degenerative illnesses that affect mostly Chihuahuas, Labradors, Poodles and Cocker Spaniels. 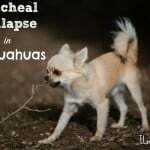 If your Chihuahua is loosing vision this could be the cause and you should seek veterinary attention immediately. Some eye diseases such as glaucoma cause irreversible vision loss, however, other causes, such as cataracts, lead to a reversible vision loss that can be corrected with surgery. Prevention is very important, therefore, pet parents should not let eye infections untreated and a veterinarian should investigate any signs of diabetes or eye disease. What Pet Parents Can Do To Ease The Life Of A Blind Dog? Consider getting a Muffin’s Halo for your dog. You can read about it and order one here. Amazon also has them here. So have you had to deal with blindness with your dog? How have you dealt with it? Let us know in the comments! 1. Putting down a rug at the bottom of stairs that was a stark colour difference from the actual stairs. So, in our case our stairs and landing were cream coloured. We put down a black rug so she could see the difference in colour/hue so she knew when she was near the bottom. 2. We sprayed both the top and bottom steps of stairs with Lavender essence so she could smell how close she was to the top or bottom. 3. While out for family walks/hikes, we made sure there was always a family member ahead of her on paths/sidewalks so she had someone to follow rather than take the lead and not know where she was headed. 4. When she was asleep and we needed to wake her we would calmly pet her until she woke so as not to startle her. Toward the end of her life she was both fully deaf and nearly blind. It was a challenge but we found many ways to communicate with her and show her she was loved. She was still VERY happy right up until the last few days of her life. Blind (and deaf or deaf-blind) dogs can lead a very productive, happy life! All they need is caretakers who love them enough to make their life comfortable and safe! Great ideas Melissa! Thanks for sharing! Glad you liked it Crissy. How lucky your pup was to have such supportive humans! My 15 year old 2.5 lb chi has lost sight in both eyes due to cataracts and her hearing. Both eyes are white now. She is a creature of habit and as long as we don’t rearrange the house, patio and back yard, she does fine. She has lived her whole life in this house. She has some degree of vision…although it is hard to believe because her eyes look completely opaque. She seems to recognize contrast. For example, she can see the dark mat at the back door against the color of the concrete patio. She often gets “lost”. She will lose track of her location. If she can’t figure it out quickly, she gets edgy and nervous. When she feels a human touch, she relaxes. If she is left alone to sleep, when she wakes up, she will bark until someone comes to assure her she is not alone. In the past month or so, she has fallen down the carpeted stairs a couple of times. At 2.5 lbs, that is a long distance to tumble! She has fallen off the bed a few times too. We have to make sure to keep an eye on her all the time…unless she is confined to a small area that is completely free of hazards.She hasn’t been injured in any of her falls. The falls down the stairs scared her. The falls off the bed seem to have no impact on her at all (no pun intended). She still gets spunky at times and loves her treats! At 15, I know her days are coming to an end before long…we just try to make every day a good one for her. Alan, someone told me that they put a few of those foam noodles, the kind kids play with in the pool, under the fitted sheet around the bed so as to provide a barrier for their blind Chi. Also you might want invest in a gate at the top of the stairs to keep her from falling down. I too have a completely blind chi. She’s 15 and owns my heart. Sara does very well being blind. She needs help getting down the back steps to the back yard but can get up the stairs just fine. Doesn’t fall off bed etc. she recently has been diagnosed with congestive heart failure but is doing really well on the 3 medications the vet has her on and we are praying that this will give us a few more precious years with her. She also has ear infections – often. We also have a 9 year old male chi mix – Henry. He is allergic to vaccines fleas and BEES ! he has been stung 3 times and rushed to the ER each time very scary !! He’s very light colored green eyes and a sensitive boy . I’m glad you found us too Bobbie! Wow, green eyes! I bet he’s a pretty boy. I hope you have many more years with both him and Sara. I think my 4 year old chi might be losing some of her eyesight and hearing. She has that ear vascillutis and the vet said pretty much nothing elae can be done. Her eyes are pretty much black all the time and seem to look diffrent to me. This could be a quirk cuz she only does it when I have food but she kinda squints/narrows her eyes at you. Plus she is misjudging her jumping. But the vet says shes fine and she loves watching things go on out the window so Im just wondering if its just starting or if Im overreacting. Just cant shake the feeling something is up with her. She also has begun to snore at night. The snoring is very common in Chis due to their short snouts and tracheas. The vision thing is probably nothing but it’s worth it to keep an eye on it Jen. We moms seem to have a 6th sense when something is not quite right about our kids, whether they be human or fur kids. 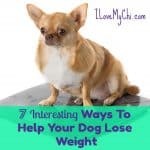 My 6 year old Chi went suddenly blind a few weeks ago, this started with a huge increase in appetite, I now know he has SARDS – Sudden Acquired Retinal Degeneration, one of the first symptoms in the increase in appetite and that he wanted to walk behind me not out front like normal. We have just gone to see the opthamologist this week to confirm this diagnosis, unfortunately there is nothing that can be done. All being said though he isn’t completely blind at this point it appears he is just having issues within a few feet of him, his distance doesn’t seem too bad. But we have been told this was likely progress until he cannot see at all. So far he is doing amazing, still loving his walks and managing really well at home. We don’t have stairs inside so that makes things easier for him. I am hopeful he will continue to do well as he is now and we have been told his prognosis is for a full and long life that any Chi would have. I’m glad he’s doing so well Christine! 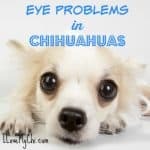 Our Chihuahua Spike developed glaucoma and cataracts, and we took him to an eye specialist. We controlled the glaucoma with drops…went from 30 to 3 and his glaucoma was never a problem but his heart was bad, so he could not stand surgery for the cataracts. Is he completely blind Kay or can he see some? Our 15 year old Chi is going deaf and blind. She was always running into the glass patio door And the screen door. At the bottom of the doors we put a large X with painters green tape. She hasn’t had any accidents since! That’s interesting Dianne. Do you think she is feeling the tape? Or is she still able to see it? I adopted a senior chi in March. She had been abandoned on the streets. She had a badly infected eye which needed to be removed and her other eye looks great but she can’t see anything from it. She gets along great. She learned the house and yard layout in just a few days. We have a carpet runner on the back porch leading to the door. When she hits the carpet she knows to follow it to the door. We don’t move furniture and a baby gate at the top of the stairs. At times I catch myself forgetting that she can’t see. What a little sweet heart she is! Sounds like she’s pretty smart too. Thank you for giving her a home. My little Gizmo🐶 Is 13 years old. She is both blind and deaf, and extremely anxious all the time. She does not like to be picked up and held. I only comfort her briefly before she starts to cry and wants to be let go. It seems her only happiness is her food and bed, and once in awhile a short walk (on a leash with me) in the sun. She panics whenever I get her in the car to go anywhere. I have to medicate her with pretty sedating. medication for longer trips. Breaks my heart. She seems miserable most of the time. Other than that she is in perfect health. I don’t know what to do to help her relax. I know you said she doesn’t like to be picked up but does she like to be petted or touched at all? I learned some simple pet massage strokes that helps calm them down when they are anxious. My Chi is now 8 years old and just this past week it seems like she went from seeing fine to bumping into things. She did start with an extreme increase in appetite that she looked bloated, we took her to the vet and they told us to lower her eating servings by 2 and to 1/2 cup based on her weight. We have been doing that for about a month now, but just yesterday we noticed the bumping into things and she isn’t as playful and happy. We try to play with her and she just wants to go to bed. She has a doctors appointment today, so we will see. It breaks my heart to see her so sad! Also, she did spit saliva yesterday on me twice, it was as though she didn’t even feel it coming out, there was no movement what so ever. Has anyone experience this? Help! It definitely sounds like something’s wrong but I don’t know what it could be. Let us know what the vet says. I wouldn’t put her down if blindness is her only issue. Many blind dogs do fine after a period of adjustment. I would get her checked as soon as you can for her good eye. If it’s infected, they can give her antibiotics to save it. She is doing so well. She is getting down and exploring the house and relearning her environment! She still slowly and gently bumps into things but it’s only been a few days. Good for little miss Texas! It’s surprising how easy most of them adjust to blindness. They do much better than humans do. I have 6 rescue Chihuahua’s 1 is 5 yrs. 4 are 8 yrs. and 1 is 10 yrs. So far everyone is very healthy. Thanks for the heads up on the vision issues. So far no problems. You’re welcome Sheila and God bless you for giving a home to all those little fur butts. It has been suggested and researched that beet pulp anything contianing beet pulp can lead to blindness in dogs. Most companies use beet as a “digestive” indgreint but it has shown to lead to blindesss on dogs. And let there be known that pet food is not regulated as much as we tend to believe that it is. 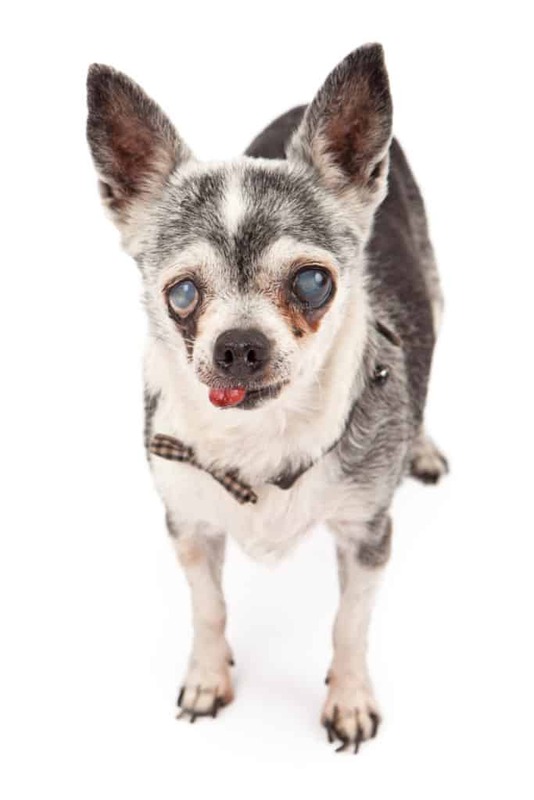 Came across this when I adopted a blind chihuahua from certain death at the shelter. So I looked up what could be The reasons that had cause the blindness. And BEET seemed to be the major issue of blindness . There has been years research and study. After learning this I bought her wholesome food, not kibble . To my supplies the brand that the vet recommend to me was a very popular one and it contained BEET . I threw that kibble away. And now she and my other chis,eats Whole Foods, raw dehydrated dog food, and fruits and veggies for treats as well . And have a pet fountain. I haven’t heard that before Jennifer. Thanks for letting me know about it. I’ll do some research and add it to the article.